Apr 14 2014 (IPS) - Malawi’s President Joyce Banda is campaigning ahead of next month’s elections to extend her term of office. But many believe that the massive public service corruption scandal here has weakened her chances of winning. This southern African nation goes to the polls on May 20. However, after a February auditor’s report into the scandal revealed that 30 million dollars were stolen over just six months in 2013, Africa’s second female president has faced calls to resign. 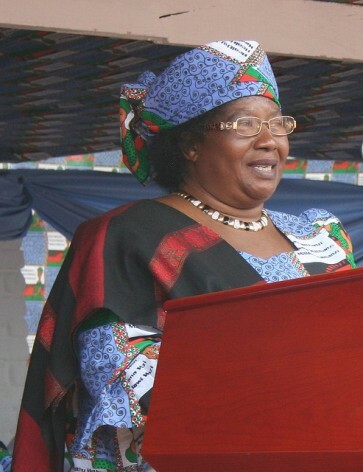 She become president in April 2012 after her predecessor President Bingu wa Mutharika died in office. But Banda is confident that she has done more than enough to address the corruption — where a total of more than 100 million dollars were suspected to have been looted from the government since 2006 — and ensure her chances of retaining office. She has taken on the powerful players involved in the corruption scandal and arrested 68 people, including a former cabinet minister, businessmen and senior public officers. “Cashgate” was first exposed last September after a failed assassination attempt on a government budget director who was believed to be on the verge of revealing the theft. Q: President Banda, it’s been a tough two years of fighting to right a sputtering economy left by your predecessor, the late President Mutharika. How have you fared? A: We inherited an economy that was in a crisis. Today, we have turned around the economy because we took decisive action to heal the country, recover the economy, and build a strong foundation for growth. It’s been two years since our people spent hours in fuel queues, it’s been two years since businesses struggled to access foreign exchange. Q: How did you manage to do that? A: We agreed to swallow the bitter pill and made unpopular decisions like the devaluation of the Kwacha, we have been implementing a tight monetary policy…our fiscal policy has been tight. These are some of the pills that have set the economy on a path of healing and represent the foundation of a transformational agenda that we will implement in the next five years. Q: You rightly said that your first job was to bring back donor confidence and unlock aid which was withdrawn. You did that but now because of the “Cashgate” scandal, donors have suspended 150 million dollars in budget support. Do you take responsibility for this? A: Yes, I do because “Cashgate” happened on my watch and my job entails that I take responsibility and deal with it. This is why we have taken far-reaching measures in dealing with fraud and corruption and engaged foreign forensic auditors to get to the bottom of this corruption in the public service. Q: Your critics think your administration is not doing much to get to the bottom of all this. Any comment? A: Sixty-eight people, including a former member of my cabinet, have been arrested, more than 18 cases are already in court, 33 bank accounts have been frozen. This is the risk I have taken which very few African leaders do when they are facing an election. I have vowed not to shield anyone, even if it means one of my relations is involved. Now tell me, is this not proof enough that we are taking this corruption very seriously? Q: But many believe that you personally benefited from this “Cashgate” scandal. What do you say? A: When you are fighting the powerful, an influential syndicate like this one, this is not surprising. Secondly, this is an election year and you will hear a lot of things but the truth shall come out. The other thing you should know is that I am a woman in a role dominated by men and I am therefore not surprised that I am getting such amount of pushback…we shall overcome this, and those responsible for stealing state funds will be jailed and their properties confiscated. Q: You face an election next month and the London-based Economist Intelligence Unit has projected that you will win the election despite the scandal. Do you believe that? A: Yes I do believe that I will win this election. I also know though that it’s a close one but the advantage is that people have seen what we have done in two years. We have repealed repressive laws, we have changed the status of women, the media is free, and we allowed everyone to demonstrate freely when just two years ago people were being killed for doing just that. Q: Forbes Magazine named you as the continent’s most powerful woman. Do you feel that powerful? A: No, I don’t. I will feel that powerful when every woman in Malawi and Africa is free from hate and is empowered. I will feel powerful when woman no longer have to lose their lives because they are abused, when they stop dying from avoidable pregnancy-related deaths. I will feel powerful when women in Africa take their rightful place as equals. When you do good, you feel good. This is the reason president Joyce Banda feels good about the coming elections because her works speaks for itself and Malawians have seen what she has done for them. We see president Joyce Banda!